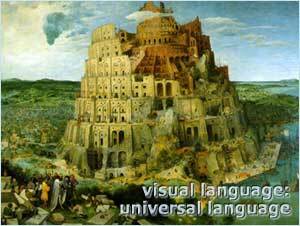 Visual language bridges communication barriers and facilitates communication among people of different cultural and educational backgrounds. Knowledge is what we store in our mind and what leads us to take decisions, act and react to stimuli received from the external world. Knowledge is very subjective and builds up in everybody’s mind through a continuous learning process involving, among others, concrete experiences, observations and reflections, formation of concepts and their testing. At one end of the spectrum we find what is considered as our “unconscious knowledge”, which is characterized by perceptions and motives that we are not aware of and which is “sealed off” by psychological conditioning. This means that we have to overcome emotional barriers in order to gain access to it. Our unconscious fades into what is frequently referred to as tacit knowledge, which corresponds to knowledge that we are not immediately aware of, on which we base our day-to-day actions, but which is somehow difficult to articulate. This type of knowledge can be elicited through in-depth discussions and interactive exercises (e.g. PRA/PLA tools) including visualizing methods like Participatory 3D Modeling (P3DM). The third category is known as explicit. This is knowledge that we are aware of, have reflected upon and can easily capture in verbal, textual, physical or visual formats (Leeuwis, 2004), and that transforms into information. It is important to appreciate these differentiations because P3DM is the method that facilitates the visualization of mainly tacit (spatial) knowledge, and increases through an intensive learning process the amount of knowledge we are fully aware of. This enhances our capacities to analyze, communicate and interact on specific issues, which got much clearer in our mind. Cognitive maps (also known as mental maps) are internal representations of the world and its spatial properties stored in memory. They frequently represent portions of our tacit and explicit knowledge and are visualized with the use of sketch maps, transect diagrams, scale maps, drawings and physical or virtual 3-dimensional models. Compared to high-tech Spatial Information Technologies, P3DM is a proven method that can be handled in rural areas within locally available technical capacities, and can visualize spatial knowledge particularly among communities characterized by low literacy, language barriers and lack of basic utilities (e.g. electric power) (Tan-Kim-Yong, 1992 and 1994; Rambaldi et al., 2000 and 2002; Hoare et al., 2002). Different from other visualizing tools (i.e. sketch mapping) characterized by variable levels of accuracy, 3-D modeling offers the opportunity to produce relatively precise geo-referenced and scaled qualitative and quantitative data, adding substantial value and communication power to indigenous technical knowledge (ITK).